Anti-government lawmakers shout "Fraud," during a session of Venezuela's National Assembly, in Caracas, Venezuela, Aug. 2, 2017. Venezuela's president and election chief on Wednesday denied a report that voter turnout numbers were “manipulated” and inflated by at least one million for the controversial election to choose an assembly to rewrite the national constitution. 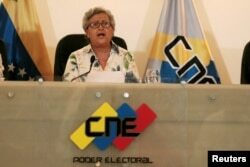 The head of the National Election Council, Tibisay Lucena, said the claim by a British election-technology firm was “irresponsible,” and she threatened to begin legal action against the company. “This is an unprecedented opinion from a firm whose only role in the electoral process is to provide certain services and technical support that has no bearing on the results,” Lucena said. Venezuela's National Electoral Council President Tibisay Lucena speaks during a news conference in Caracas, Venezuela, Aug. 2, 2017. “This election cannot be stained by anyone, because it was a transparent vote,” Maduro said. 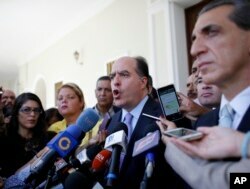 Julio Borges, center, President of Venezuela's National Assembly, speaks during a news conference prior the start of a session of Congress in Caracas, Venezuela, Aug. 2, 2017. 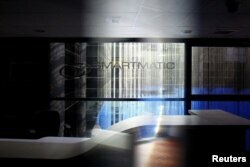 The corporate logo of Smartmatic is seen at its offices in Caracas, Venezuela, Aug. 2, 2017. The United States imposed sanctions against Maduro on Monday for what it called his “illegitimate” election of a body to rewrite the constitution. All of Maduro's assets in the United States are frozen and Americans are forbidden from doing any business with him. Venezuela's President Nicolas Maduro, 2nd right, speaks during a meeting with members of the Constituent Assembly in Caracas, Venezuela, Aug. 2, 2017. The text in the back reads, "Heroic Venezuela." 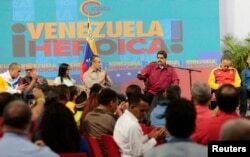 Maduro raged on television that he does not care. 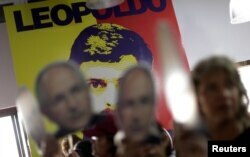 Pence reminded Maduro the U.S. position that he is “personally responsible” for the health and safety of opposition leaders Leopoldo Lopez and Antonio Ledezma, who were dragged out of their homes in the middle of the night earlier this week and taken to military prison. The Supreme Court accuses the two of breaking the terms of their house arrest for previous opposition activities and planning to flee the country. Lopez' lawyer denies the charges. The drop in global energy prices and political corruption have destroyed Venezuela's oil-rich economy. Gasoline, medicine and such basic staples as cooking oil, flour and sugar are scarce, and many Venezuelans cross into neighboring Colombia and Brazil to buy food. Mauro has blamed the country's woes on what he calls U.S. imperialism and its supporters inside Venezuela. He has warned against intervention by the Organization of American States, saying that would surely lead to civil war.